You are currently browsing the tag archive for the ‘TPM’ tag. Why is the sentence incoherent? RNA-Seq can be used to estimate transcript abundances in an RNA sample. Formally, a sample consists of n distinct types of transcripts, and each occurs with different multiplicity (copy number), so that transcript i appears times in the sample. By “abundance” we mean the relative amounts where . Note that and . Suppose that for some j. The corresponding is therefore where . The question is what does this value correspond to in RPKM (or FPKM). The term in the denominator can be considered a kind of normalization factor, that while identical for each transcript, depends on the abundances of each transcript (unless all lengths are equal). It is in essence an average of lengths of transcripts weighted by abundance. Moreover, the length of each transcript should be taken to be taken to be its “effective” length, i.e. the length with respect to fragment lengths, or equivalently, the number of positions where fragments can start. The implication for finding a relationship between FPKM and relative abundance constituting one transcript copy per cell is that one cannot. Mathematically, the latter is equivalent to setting in the formula above and then trying to determine . Unfortunately, all the remaining are still in the formula, and must be known in order to calculate the corresponding FPKM value. The argument above makes clear that it does not make sense to estimate transcript copy counts per cell in terms of RPKM or FPKM. Measurements in RPKM or FPKM units depend on the abundances of transcripts in the specific sample being considered, and therefore the connection to copy counts is incoherent. The obvious and correct solution is to work directly with the . This is the rationale of TPM (transcripts per million) used by Bo Li and Colin Dewey in the RSEM paper (the argument for TPM is also made in Wagner et al. 2012). Why is the sentence informative? Even though incoherent, it turns out there is some truth to the ranges and estimates of copy count per cell in terms of RPKM and FPKM that have been circulated. To understand why requires noting that there are in fact two factors that come into play in estimating the FPKM corresponding to abundance of one transcript copy per cell. First, is M as defined above to be the total number of transcripts in a cell. This depends on the amount of RNA in a cell. Second are the relative abundances of all transcripts and their contribution to the denominator in the formula. The best paper to date on the connection between transcript copy numbers and RNA-Seq measurements is the careful work of Marinov et al. in “From single-cell to cell-pool transcriptomes: stochasticity in gene expression and RNA splicing” published in Genome Research earlier this year. First of all, the paper describes careful estimates of RNA quantities in different cells, and concludes that (at least for the cells studied in the paper) amounts vary by approximately one order of magnitude. Incidentally, the estimates in Marinov et al. confirm and are consistent with rough estimates of Galau et al. from 1977, of 300,000 transcripts per cell. Marinov et al. also use spike-in measurements are used to conclude that in “GM12878 single cells, one transcript copy corresponds to ∼10 FPKM on average.”. The main value of the paper lies in its confirmation that RNA quantities can vary by an order of magnitude, and I am guessing this factor of 10 is the basis for the range provided in the ENCODE PNAS paper (0.5 to 5 FPKM). In order to determine the relative importance of the denominator in I looked at a few RNA-Seq datasets we are currently examining. In the GEUVADIS data, the weighted average can vary by as much as 20% between samples. In a rat RNA-Seq dataset we are analyzing, the difference is a factor of two (and interestingly very dependent on the exact annotation used for quantification). The point here is that even the denominator in does vary, but less, it seems, than the variability in RNA quantity. In other words, the estimate of 0.5 to 5 FPKM corresponding to one transcript per cell is incoherent albeit probably not too far off. The ENCODE PNAS paper was first published behind a paywall. However after some public criticism, the authors relented and paid for it to be open access. This was a mistake. Had it remained behind a paywall not only would the consortium have saved money, I and others might have been spared the experience of reading the paper. I hope the consortium will afford me the courtesy of paywall next time. The content of this figure is an illustration of the gene LMNB1 (Lamin protein of type B), used to argue that microarrays can provide transcript level resolution whereas RNA-Seq can’t!! Really? Affymetrix is saying that RNA-Seq users would likely use the RefSeq annotation which only has three isoforms. But this is a ridiculous claim. It is well known that RefSeq is a conservative annotation and certainly RNA-Seq users have the same access to the multiple databases Affymetrix used to build their annotation (presumably, e.g. Ensembl). 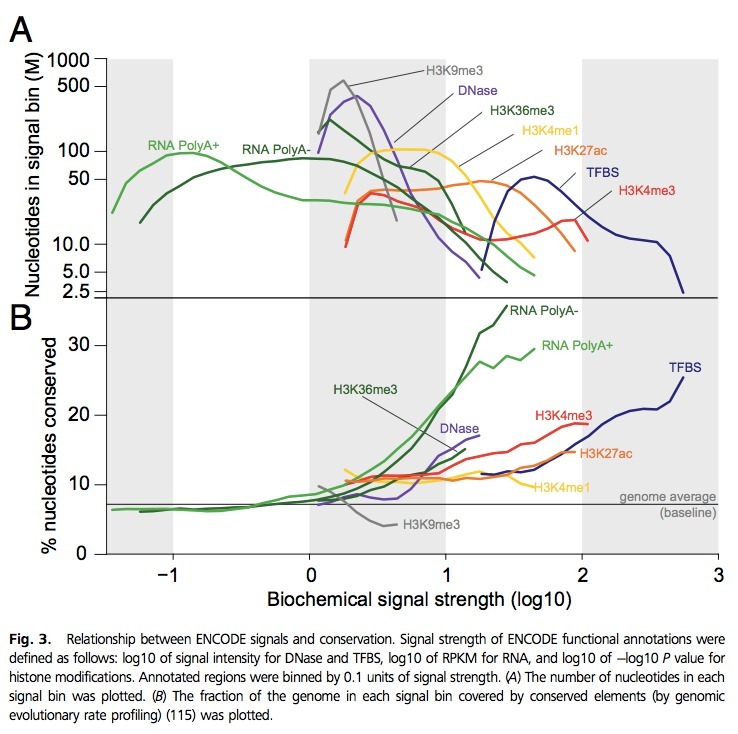 It therefore seems that what Affymetrix is saying with this figure is that RNA-Seq users are dumb. In these equations is the length of transcript t (if reads are long it is necessary to modify the length due to edge effects, hence the tilde in the paper), the are the maximum likelihood estimates for the probabilities of selecting reads from transcripts (unnormalized by their length) and finally is the number of reads mapping to transcript t while N is the total number of mapped reads. The point is that RPKM (the rightmost formula for abundance) is really a unit for describing the maximum likelihood relative abundances ( ) scaled by some factors. RPKM as a unit has two problems. The first is that in current RNA-Seq experiments reads are paired so that the actual units being counted (in ) are fragments. For this reason we modified RPKM to FPKM in the Cufflinks paper (the “F” replaced “R” for fragment instead of read). A more serious problem, noted by Bo Li and Colin Dewey in their paper on RSEM, is that while FPKM is proportional to ML estimates of abundance, the proportionality constants may vary between experiments. For this reason they proposed TPM (transcripts per million) which is also proportional to the ML abundance estimates but with a proportionality constant (a million) that is the same between experiments. All of these units are used simply to avoid writing down the which are in many cases tiny numbers since they must all sum to 1. Returning to the Affymetrix figure, we see the strange RPM units. In essence, this is the rightmost term in the equation above, with the length terms removed from the denominators. Therefore RPM is proportional to the . If a transcript is short, even if it is equally abundant to a longer transcript ,it will produce less RNA-Seq reads and therefore its will be (possibly considerably) smaller. The effect of displaying RPM for RNA-Seq vs. expression level for the HTA 2.0 arrays is therefore to mix apples and oranges. Since what is being displayed is a coefficient of variation, there is a bias caused by the relationship between length and expression (e.g. many highly expressed housekeeping genes are short). Here its a bit hard to tell what is going on because not all the information needed to decipher the figure is provided. For example, its not clear how the “expression of exons” was computed or measured for the RNA-Seq experiment. I suspect that as with the previous figure, read numbers were not normalized by length of exons, and moreover spliced reads (and other possibly informative reads from transcripts) were ignored. In other words, I don’t really believe the result. Having said this, it is true that expression arrays can have an advantage in measuring exon expression, because an array measurement is absolute (as opposed to the relative quantification that is all that is possible with RNA-Seq). Array signal is based on hybridization, and it is probably a reasonable assumption that some minimum amount of RNA triggers a signal, and that this amount is independent of the remainder of the RNA in an experiment. 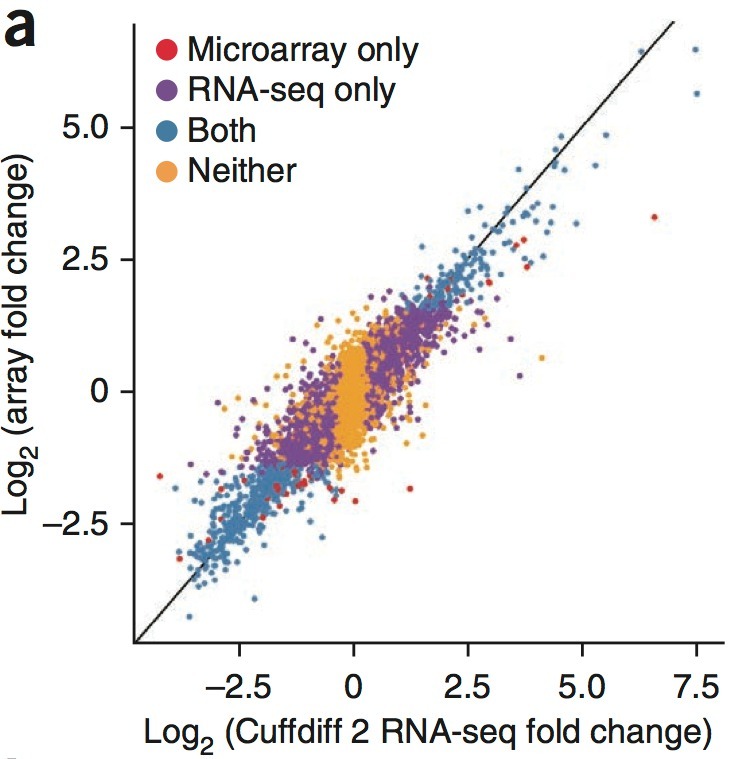 So arrays can (and in many cases probably do) have advantages over RNA-Seq. There are a few papers that have looked into this, for example the paper “A comprehensive comparison of RNA-Seq-based transcriptome analysis from reads to differential gene expression and cross-comparison with microarrays: a case study in Saccharomyces cerevisiae ” by Nookaew et al., Nucleic Acids Research 40 (2012) who find high reproducibility in RNA-Seq and consistency between arrays and RNA-Seq. Xu et al., in “Human transcriptome array for high-throughput clinical studies“, PNAS 108 (2011), 3707–3712 are more critical, agreeing with Affymetrix that arrays are more sensitive at the exon level. For disease studies, they recommend using RNA-Seq to identify transcripts relevant to the disease, and then screening for those transcripts on patients using arrays. There are definitely continued applications for arrays. Both in high-throughput screening applications (as suggested in the Xu et al. paper), and also in the development of novel assays. For example Mercer et al. “Targeted rNA sequencing reveals the deep complexity of the human transcriptome“, Nature Biotechnology 30 (2012) 99–104 show how to couple capture (with arrays) with RNA-Seq to provide ultra deep sequencing in subsets of the transcriptome. So its not yet the time to write off arrays. But RNA-Seq has many applications of its own. For example the ability to better detect allele-specific expression, the opportunity to identify RNA-DNA differences (and thereby study RNA editing), and the ability to study expression in non-model organisms where genomes sequences are incomplete and annotations poor. 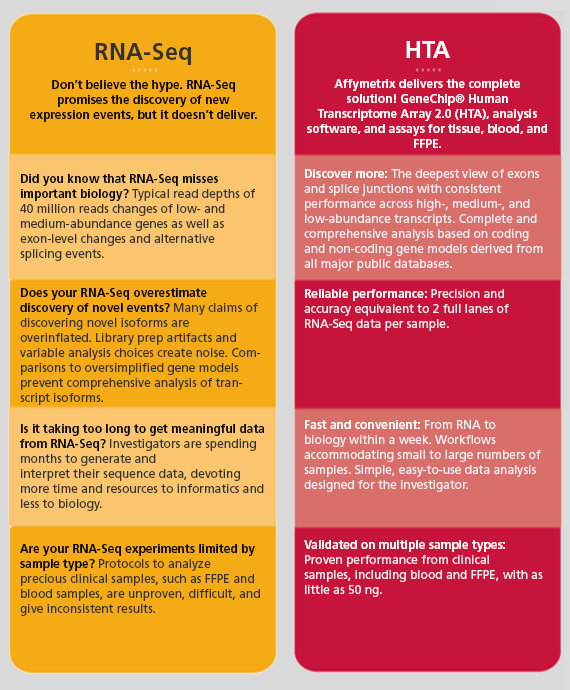 For all these reasons I’m betting on RNA-Seq.